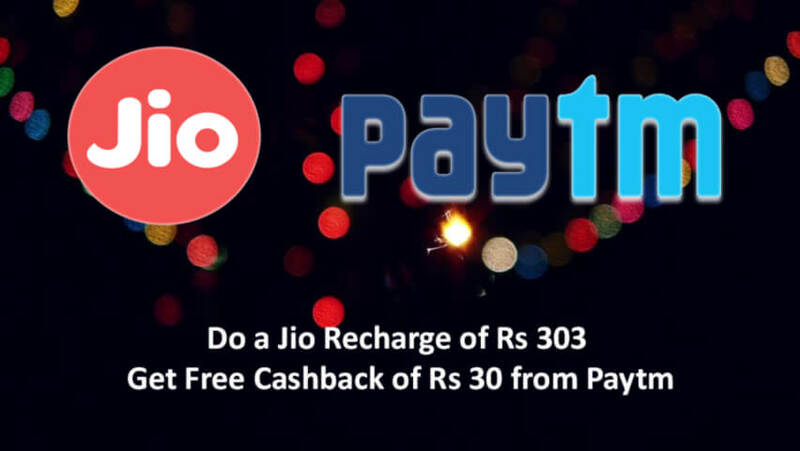 Jio Recharge of Rs 303 and Get Rs 30 cashback from Paytm. It's very great to know that the Jio officially Declared premium plans at very low price. Lots of Peoples are activating Jio Prime Membership to continue Free Unlimited Offer. Yeah, It's true that You've got pay for it. There is no any trick or any app will activate free Jio Prime and Do not download and install unofficial apps from the Internet. On the Behalf of Digital India Campaign, Paytm Officially announced their offer for the Jio Users. This offer is valid for both Prime Members and Non-Prime Members. In this offer when you do the recharge of any pack above of Rs 303 then you will get free cashback of Rs 30. It means they are giving maximum 10% cashback on any Jio Recharge. Jio 303 Pack will give you 1GB free Unlimited 4G Data every day with free Local and STD calls, and of course, Free Unlimited SMSs. This Offer is the best and cheapest offer ever rather than other telecom companies. Paytm Offer is valid for the limited time only. So, hurry up guys, before it ends up their deal. Here are some steps to follow to get free Cashback from Paytm. How to Get Rs 30 discount on Rs 303 Jio Recharge at Paytm? Login/Sign up on Paytm website. Now do a Recharge of Rs 303 or higher from your Jio SIM. Once your coupon is applied successfully, You will get the cashback of Rs 30. Now Proceed to Pay the remaining balance and Complete the Transaction. Get Rs 30 off on Jio recharge of Rs 303 or more & Rs 150 Cashback on movie tickets. Click “Proceed to Recharge” and enter PAYTMJIO in “Have a Promocode?” section. Promocode can be done twice per user in March 2017. Promocode is eligible only on Jio Mobile recharge. MOVIE4JIO will be eligible only on booking of at least 2 movie tickets on Paytm. Maximum Cashback on movie tickets is Rs 150. Maximum discount on Jio recharge is Rs 30 per transaction. MOVIE4JIO can be done only once per user for every recharge.